Ripped these questions from oprah.com -- it's totally my style of writing. It prompts a memoir-type reaction. The picture to my left is a picture of an actual entry in my journal dated February 5th, 1989. 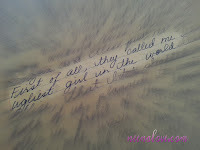 "...They called me the ugliest girl in the world..." The younger me that wrote that would love that the person I am now has shaken off the mean-ness of what those people said then. People, especially teenagers, can be mean. Who I am today is very careful about accepting any label that someone else gives me. I only take into consideration the labels that are positive and are from genuine people. There is a children's book titled You Are Special by Max Lucado. This book is a MUST HAVE for any book collection. I heard it for the very first time about 2 or 3 years ago in a class at church. The teacher read it to the class to set the tone for the lesson she was going to share with us. I don't recall what the lesson was about. The only thing that stuck with me is that story. The city where the Wemmicks live has a system of giving out stars for their favorite people and dots to the people they dislike. Punchinello always seemed to acquire dots and never any stars. This affected how he felt about himself until a fateful day when he happened upon a special person without any stars or dots. Anyway, the me today has not allowed that really mean label of "ugliest girl in the world" to stick to me. That is the best thing that younger me would love about present me. The book I'm reading right now is long overdue.... Atlas Shrugged by Ayn Rand. When I was a little girl, I remember clipping an article that ranked Atlas Shrugged in the top ten of most influential books of all time. I never forgot that. Here I am at age 38 just getting around to reading it. So far, it is well-written however I'm still in the beginning stages of the set up of the story. to see and be amazed. On a side note - I have always been a fan of magazines. I was co-editor of the yearbook in High School and that is where I fell in love with the whole layout-written-word-photography thing. Even now I subscribe to magazines just to look at the design in it. And for the most part, I do read the articles and consume the pictures. O Magazine is still my favorite. The combination of meaningful articles, fantastic photography and art work, tasteful ad designs, and fabulous layouts makes it my favorite. 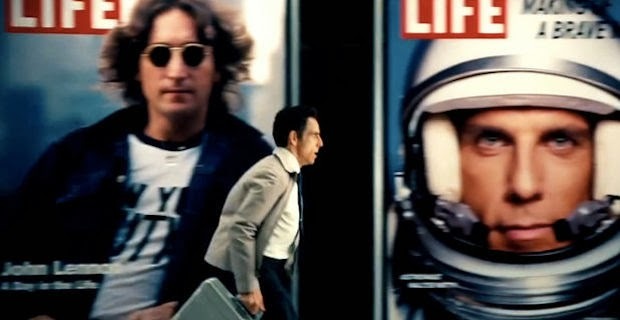 Thank you Walter Mitty for reminding everyone to live LIFE. I always knew that I have never wanted to be a single mother. This is not saying that single mothers are mistakes. I just knew it was/is not for me. Raising a child alone was NEVER on my to do list. I remember a couple of my friends becoming mothers when we were 14, 15 and I just knew that I had other things to do besides being a mother. Anyway, who wants to do it all alone? This is such a weird question but I guess it's valid because there is a place inside all of us that wants to be something different than what we are right now. Conservatives probably think about living out some secret, wild life. Piercing their nose or tongue or cheek. Dying their hair hot pink. Doing a mohawk hair style. All of us have some kind of idea of what we're not, what we think we are, and what we would do if we weren't afraid of criticism. So my ideal outfit is pictured here. Visit Monif C.'s website to check out snazzy, downright gorgeous stylings for the plus size woman. I think this outfit is so fabulous! It comes from Monif C.'s 2012 collection. I love the color, the drama, the designers selection of chiffon, the print, the silhouette of it all. This is so my style! It is absolutely gorgeous and looks very lux and expensive. I would totally rock this if I were going out to a fancy event tonight but since I'm not, I pinned this dress to my "Fashion Dreams" pinterest board. My life is such an open book. The stuff that I put on this blog is major evidence! I can't think of anything that I have hidden. Actually, I take that back. My teenage life is fairly a mystery on this blog. Who really talks about what they did as a teenager? Above, I posted a small pic of my journal with those mean words that someone called me. Teenagers can be mean and bully-ish of those guys that called me . I have to say that I was one of those mean, bully-ish people in elementary. It was the 2nd grade and her name was Jennifer Mackey. I'm not sure if the spelling is correct. She was a fair skinned haole girl with blond hair and light eyes. She used to come to school wearing a rain cap or a wig everyday. At that point in my life, I did not quite understand what it meant when an eight-year-old had to wear a rain cap or a wig to school. Of course now I do but this is thirty years later. I was so mean to her and I can't even remember why except that maybe she was different from us (all my friends). I remember pushing her into the mud. She stood up, started crying, and yelled at me to stop being a bully. She never gave in to my tantrums. She just kept fighting back. I wish I weren't that mean little girl that I was. I wish I could find her and apologize to her for being such a bully. SAY NO TO MORE WIND TURBINES IN KAHUKU!